Fourth of July has fireworks, Labor Day has Concerts in the Park. Right? The lovely weather of September makes it perfect to pack up a blanket and a small cooler and head out to Fred Fletcher Park. If you live downtown and this does not ring a bell, boy, you’ve missed something. Scenery-wise, Fletcher it is probably the nicest, and certainly less crowded than Pullen Park. It does not have a lot of playground equipment, other than a sandbox and swings. And speaking of a sandbox, that is also the name of the band that is playing at Fred Fletcher on Sunday night. Lawn chairs and coolers welcome, alcoholic contents not. Sandbox has a nice website that gives you an idea about their style. What I like is that they play a combination of traditional children songs as well as their own work. Some of their songs can be previewed on their website. 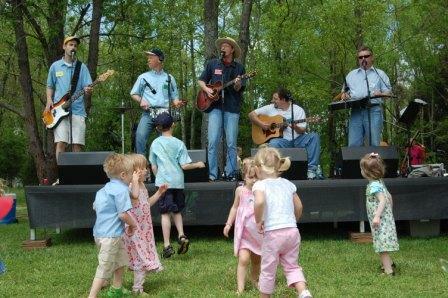 This entry was posted in Holidays, Music, Outdoors, Stage by daddyweekly. Bookmark the permalink.